We stayed there 2 years ago on our wedding night and so on returning for anniversary they upgraded us to honeymoon suite. Amazing! Spectacular views and location on the beach a few minutes walk from main town. Staff are polite and friendly. Breakfast is good and make eggs to order. We ate one evening on beach restaurant and were disappointed with both food speed and quality for the over inflated resort prices. We wanted a massage but they couldn't fit us in but resort next door do gteat massages on the beach much cheaper. Would highly recommend staying here if you like luxury rooms and nice touches. We are glad to be part of your time.We are always looking forward to your return. We stayed one week at phra Nang Lanta and it's wonderful place, Quiet, Good location and you can have everything around you.. The beach is lovely and in night time you just enjoy the ocaen sound.. We feel like home during stay there.. Room we got is very nice and bed very comfortable.. We will go back there again for sure.. Thank you for sharing your valuable feedback. It is our pleasure to accommodate you. We will keep giving our best to our beloved guests as always and certainly taking our guest feedback to improve our hotel and service. Hope to welcome you again. One of the best places I have stayed in all my travels in South East Asia. In terms of location it's interior, quiet and best place for a family holiday. It's a one of its kind hotel, unbelievable hospitality from the staff. Will surely recommend it for parents with young kids and for all who want a taste of real Thailand. We will be back. Thank you for your review and for choosing our hotel. We are very pleased to know that you had a great time at our hotel and our team's effort made your stay special.It keeps us motivated in providing an excellent service to our guests especially.Looking forward to see you again on your next visit. Excellent. we stayed here for 1 night on the night of our wedding as we got married on the beach at the other end of the bay. the staff were excellent and let us check in early to allow bride getting ready time and the room was clean, tidy and with excellent views of the bay. very comfortable room and unique style, nice bathroom features. They put honeymoon decoration on the bed when we returned which was very romantic and in the morning, breakfast was very busy but they set us up a special table on the lawn to enjy breakfast. Breakfast was very 'European' standard and could do with some more authentic Thai options, but overall excellent. we would highly recommend staying here. The staff were very nice. The view from the balcony was fantastic. I would absolutely recommend the Pha Thai at the nearby restaurant Pha Thai Rock and Roll, and all the dishes at Diamond Cliff Beach Restaurant, which can provide free pick-up and send-back to our hotel. The location of the hotel is awesome. It is just at one of the most beautiful beaches at Ko Lanta. No need to go out of the hotel, you can enjoy a great sea view at the room's balcony. There is a bar called Why Not Bar which provides excellent music and fabulous fire show. We've been for a 3 nights holiday staying at this hotel , the beach has a private feel. Rooms are very clean and spacious, our room is "Sunshine" and we really enjoyed. There's a bar near the hotel, and theres a fire show. great location. Very well designed room. Koh lanta is a nice place for a 3 nights holiday. The richey restaurant features a treehouse design and by the beach dining which is really the heart of lanta. Staying at this hotel , the beach has a private feel and i feel truly relaxed. be prepared to bring repellents and sun block though. the weather during peak season is humid. after may weather starts to get a little rainy but more comfortable. would definitely visit lanta again. This hotel really worth it! The room is large and clean. Large bathroom with separated bathtub. Ocean and the beach are just in front of the room. Though the beach is full of rocks, but we can still walk up ahead to a clear and smooth beach. The snorkeling boat picked us up on the beach so we didn't have to take a bus to town. We loved this place. Did a lot of research and were really pleased when we arrived. Very spacious ocean front room. Huge balcony area with lounge chairs and hammock. A very mediterranian Vibe on a beatiful beach and Kantiang Bay has a nice village vibe with a choice of restuarants and coffee at the drunken Sailor nearby. Excellent wifi and fresh coffee in the room. As has been mentioned the staff don't engage with you and english is limited. The bar next door can be a pain if you want quiet and an early night. Grab a kayak on a fine early morning, superb! 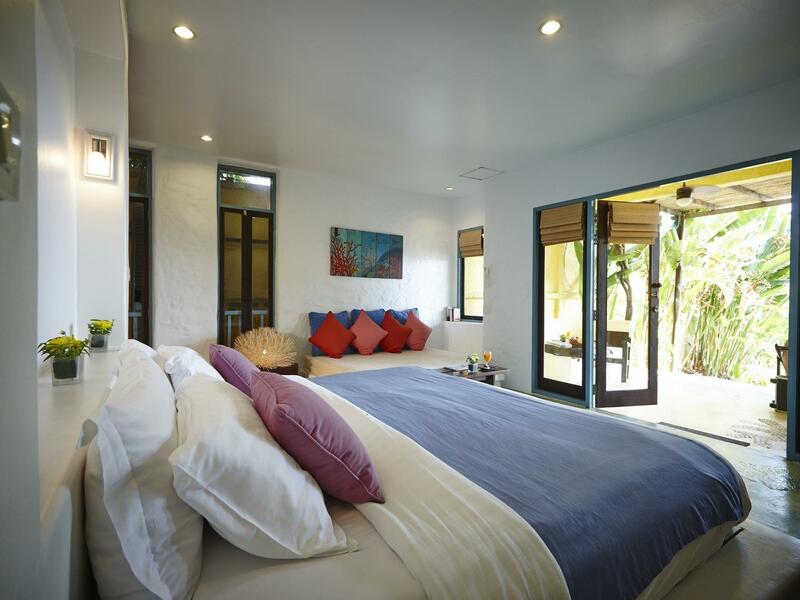 flame tree room, large king bed, small balcony overlooking the water, tv (english movie channel), fridge, in room safe. overtop the restaurant/bar, music starts at 7 am & ends at ~10 pm not too loud but rooms at the end of the building would be quieter. very attentive service, breakfast included with contintal items + egg stations (omelettes/bacon/ham). overall very nice hotel and would stay there again. a bit older than it looks on website, but very clean and everything worked. we had an upstairs room overlooking pool and beach. lovely. staff were great, nothing too much trouble. restaurant had a good menu and the food was delicious.in a quieter area but everything you need is almost out the front door and island not that large anyway. maybe 30-45 mins on scooter from top to bottom. all in all had a great break for 5 days. beautiful room designs which were spacious and very comfortable. right on kantiang bay, which in our opinion was the nicest beach on koh lanta - very natural and not crowded. the staff were excellent and the pool, and beachfront location was great too. perfect for people who want to relax. the only downside was from the moment we entered our room we could smell a cheesy foot odor. although we never complained about it, the staff went to great lengths to cover it up using oil candles, sprays etc. but it was always lingering. unfortunately we couldn't find the source but the overwhelming positives of this hotel made us forget about it! fyi our room was called flame tree. Very clean, large rooms! Chic mediterranean style. the first impression of the hotel is it's distinct mediterranean architecture and decor. rooms are very clean (i'm a neat freak and was impressed that thefloors looked like they were mopped and not dusty at all) and huge! we requested for a room far away from the why not bar, as we saw reviews that said it had live music till midnight. our room was located above the breakfast cafe, on the opposite end of why not bar, but despite this we could hear the live music though it was quite soft as our tv was on. i can't imagine what it would be like for the rooms closer to that bar! (note: our room was called flametree, beautiful room!) cons - the beach right in front of the hotel was disappointing! i chose kantiang bay as i heard it was the nicest beach in ko lanta, unfortunately the hotel is located at the edge of the bay where all the cliff rocks are. you would have to walk a good 400m at least to get to where the beach didn't have rocks. that being said, there aren't any deck chairs on the nice part ofthe beach to chill out. 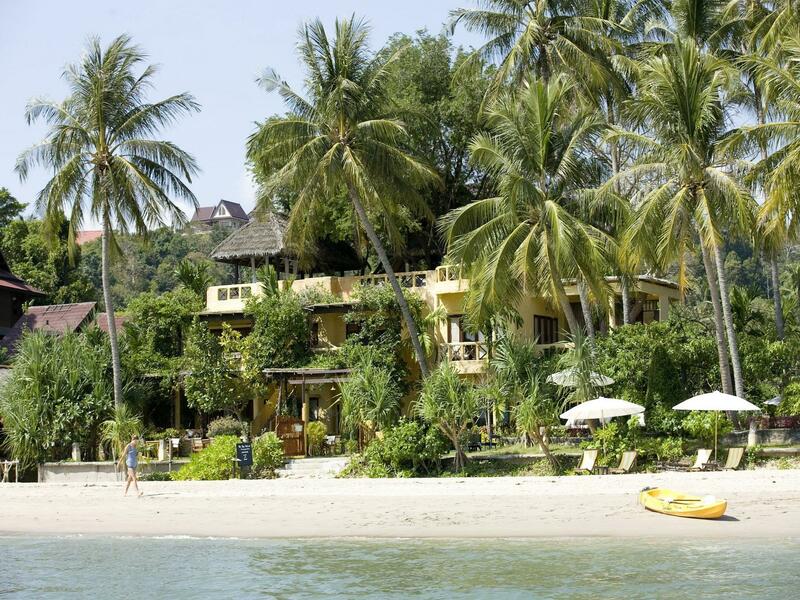 unless you are a guest at the 5 star pimalai, thats where the beach was nice with no rocks. if you love to just chill on the beach, i'd recommend any hotel at phra ae instead. we visited lanta castaway resort on phra ae and the beach there was so much better than kantiang! 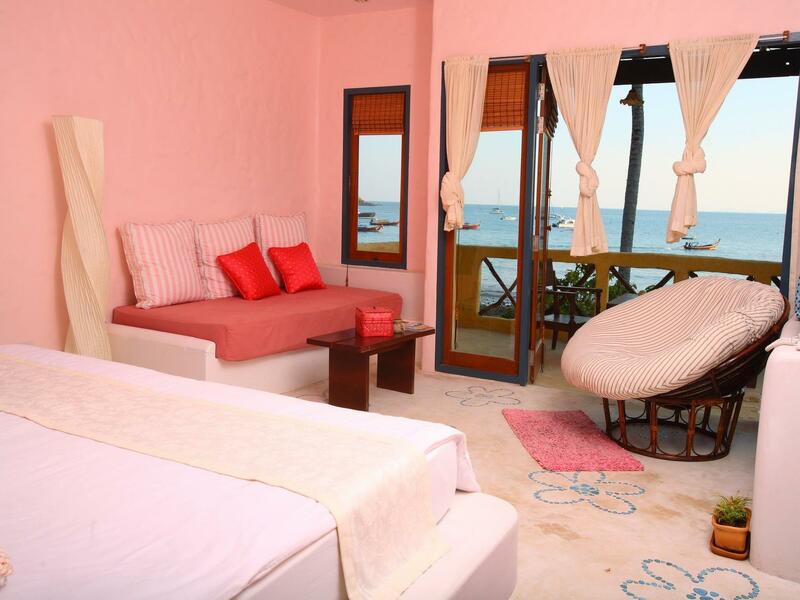 Their beach front rooms were private, especially the ones on the 1st floor, with lovely views into the bay. The staff at the resort provided service from the heart and made our stay memorable. We found the rooms to be very nice and spacious.Coming from the city to rest, the refreshing sea front rooms provided not only sea front views but came with the much appreciated sound of waves. The staff team there, all of them were such lovely people and went out of their way to make our 7 nites stay so memorable. So thank you Prung and everyone there. I do not normally write hotel reviews but felt this one time was necessary. Keep up the great work! Amazing property, right on the beach, southern beaches of ko lanta are better than northern side and it was a v pretty location to relax...their beachfront studios are really nice... amazing seafood which they happily customize to one's taste...bbqs every night make the dinning experience even better... and above all well trained staff v polite...and they offer good range of massages but gotta book in advance :-)...Overall a v relaxing stay...!!! Thank you for rating us 10 out of 10 and sharing your impressions with us. It is our pleasure to know that you had a great time at our hotel. We will keep giving our best to our beloved guests as always and certainly taking our guest feedback to improve our hotel and service. small but v attractive pool surrounded by tall palms. it felt secluded! v friendly helpful staff. breakfast was nicely done. room was spacious, bed enormous and we had the best view from our (1st floor) balcony. very confortable stay - loads of towels and toiletries and room cleaning. being further south on the island the area and beach is greener and the bay has a good feeling of not being too big or over run with tacky business. we loved our stay. would recommend! Thank you for rating us 10 out of 10 with your kind feedback. It keeps us motivated in providing an excellent service to our guests especially when we hear positive comments regarding our site and service. Right on the beach in Kantiang bay is this gem. Our room was huge, much larger than expected. You can see the ocean from your bed, amazing view and great outside sitting patio with a hammock. Our room also had a huge two person bathtub and a kitchenette. The staff is so friendly and helpful. They offered a laundry service which was helpful. The food is SO good! We loved the pad Thai and cheeseburgers. The breakfast is pretty good too. We didn’t have one bad meal there, and they will bring you food to your room for no extra charge. 7-11 is close by, as well as other shops, restaurants, travel agents, and dive shops. They offer airport and taxi services, but we found the travel agents and taxis down the road to be cheaper. The beach is also wonderful. Truly PARADISE! When we had an early departure, they prepared a sack breakfast for us to take. Con: The ONLY bad thing we can say is that there is the Why not bar right next door, which can be noisy at night, but isn’t hotel’s fault. We are glad to hear that you had a great time at our hotel. Your helpful comments are much appreciated and will help us to continually. Now all bicycle brakes has been checked and repaired as you leaved the front desk. Do not forget to borrow the bike if you come back to stay again. Look forward to your next stay.